This article is from a Science Fair, 3rd grade experiment display board we did here at Rosecomb Apiaries, spring 2015. The purpose of my project will be to mark drone honey bees in their parent colonies and see if they end up in other colonies. One of 3 colony groupings where drone drift was measured. Drones in the colony on the right were marked yellow. Drones are males. They do not collect honey. They fly to mate with a Queen. 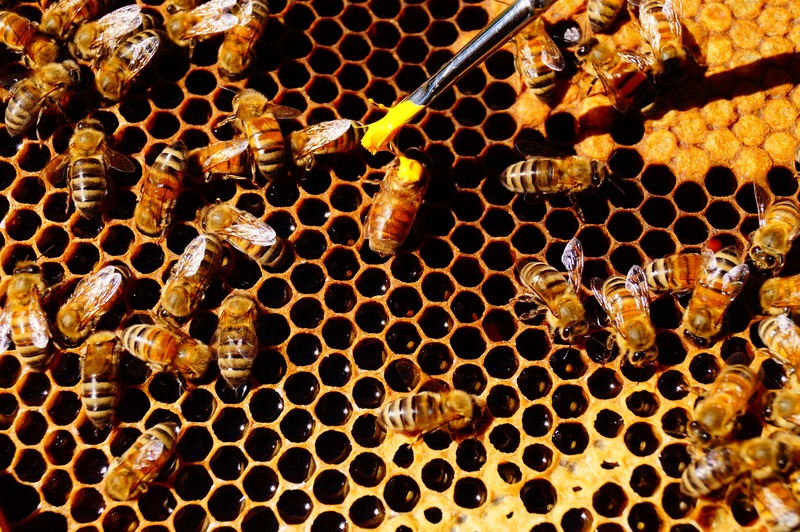 We marked drone honeybees in their parent colonies to see if they end up in other colonies. We put a dot of paint on their backs. We marked between 75 and 110 drones in 3 colonies. Each colony had it’s own color. We checked marked and unmarked colonies after 2 weeks to see where they were. 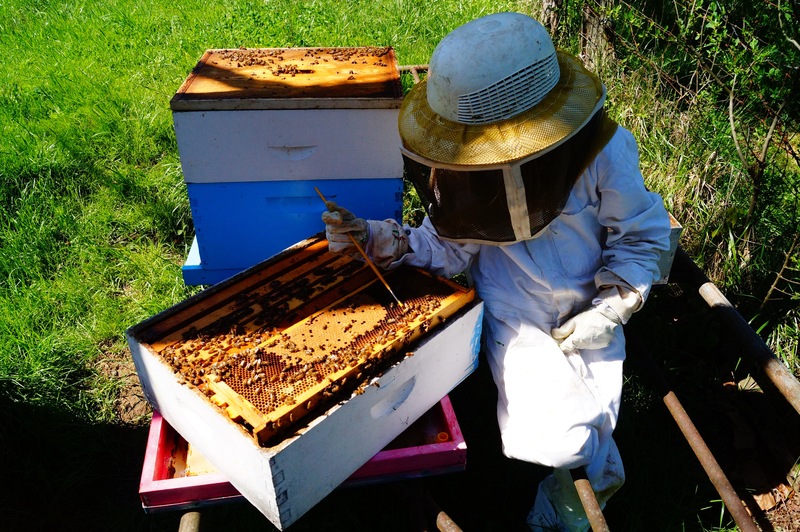 Knowing the parentage of bees helps beekeepers breed better bees. Drifting of bees from one colony to another can also affect the spread of diseases. Drones are born from unfertilized eggs. Drones are fed by the worker bees. On a warm afternoon, they go out to mate. They die after mating. Drones that don’t mate live for about 4 month’s. 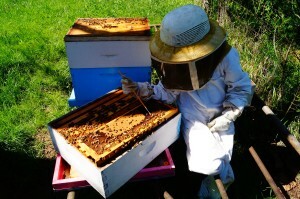 Some beekeepers will select which colonies they want to be parents for future colonies. 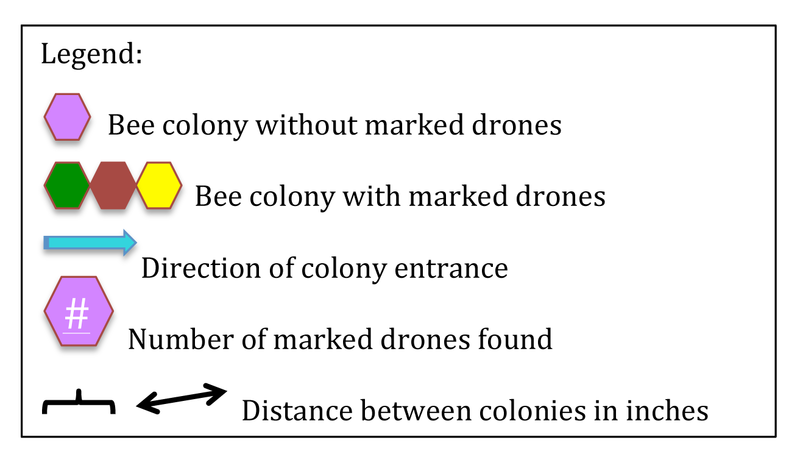 Sometimes beekeepers will confine drones to their parent colony to make sure they are selecting the drones from that colony and not drones that have drifted from another colony. 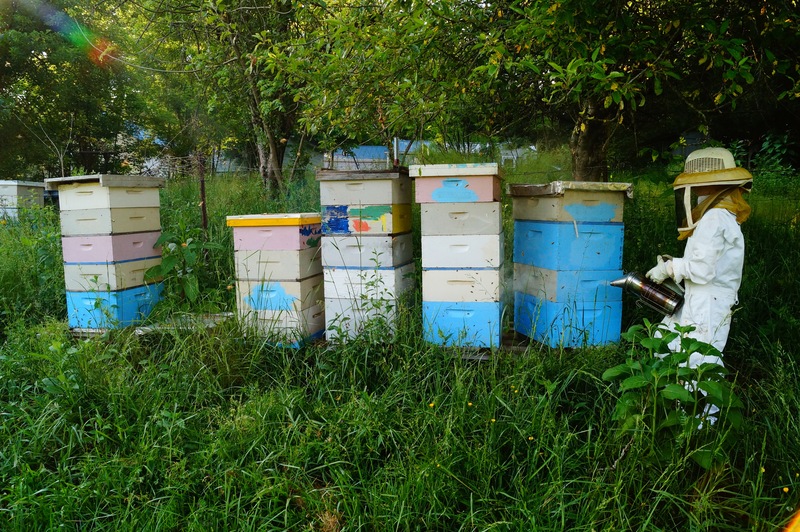 Other beekeepers feel like drones do not drift enough to require this step. Drifting of drones from one colony to another can also affect the transfer of diseases. Drones take longer to develop into adults than worker bees. This makes them more likely to be effected by parasitic varroa mites. The varroa mites reproduce and feed on the brood stage of developing bees. They can become infected with viruses during this time, and could carry these viruses and mites to other colonies. I think drones will end up in other colonies other than the ones they were born in. On April 12, 2015 we picked a colony from each of the 3 sets of colonies and assigned each a different color the drones would be marked. We opened these colonies and pulled out each frame, marking the drones we found. We decided beforehand, we would stop marking drones if we reached 110. In one colony we only found 75. The other 2 colonies had 110 drones marked. Two weeks later, on April 24th, 2015, we opened each of the 16 colonies in the experiment and counted the number of painted drones found in each colony. Each frame of each colony was removed to look for drones. We also measured the distance between each colony and recorded the direction of the entrances of the colonies. We tested 3 different sets of colonies. Each set had different colony entrance directions and distances between colonies. The set with drones marked red (see Figure 1) had entrances that pointed all the same direction and were placed close together. These colonies had the greatest amount of drift with more drones found in the colony next to the parent colony than was found in the parent colony (25 vs 22). Two drones were found in another colony in this set. The set with the drones marked green (see Figure 2) had entrances pointed in different directions, but were placed close together. It had only a little drift with 1 drone found in 2 other colonies and 31 found in the parent colony. In the set with drones marked yellow, the entrances pointed in different directions and there was a greater distance between colonies. In it no drift occurred. There were 0 drones found in other colonies and 33 found in the parent colony. Figure 1: This represents the set of 5 colonies placed close together and entrances pointing in the same direction. We marked 110 drones in the red colony and found 22 two weeks later. 25 were found in the one next to it and 2 in the next colony. This set had the greatest amount of drift in drones. 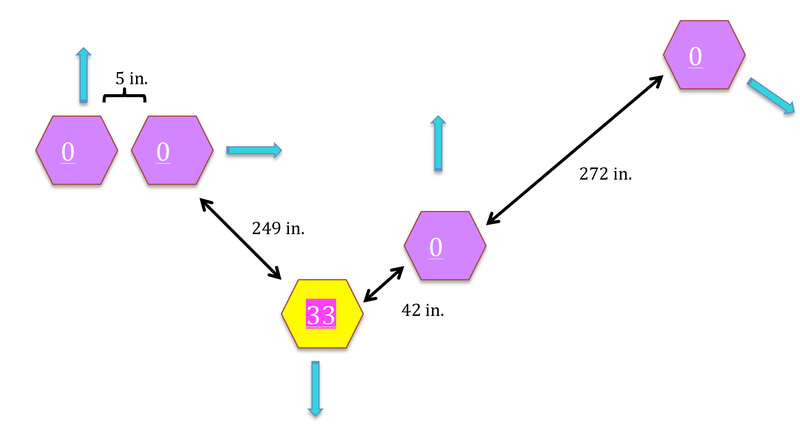 Figure 2: This set of 6 colonies were placed close together but had entrances pointing in different directions. We marked 110 drones in the green colony. We found 31 drones in it 2 weeks later. 1 drone was found in each of the colonies on the ends of the row of colonies. This set had a little drift in drones. 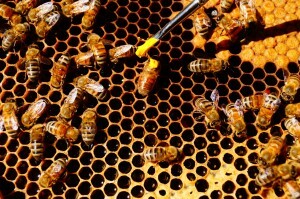 Figure 3: This set of 5 colonies had 75 drones marked in the yellow colony. 33 were found 2 weeks later. This set had the greatest distance between colonies and the entrances pointed different direction. It had no drift in drones. The distance between colonies and the way the entrances are pointed can affect drift. If you have them right next to each other and both entrances are the same you will get a lot of drift. We found there was a little drift when we had the colonies close to each other, but their entrances pointed different directions. When they were far away from each other, and their entrances pointed different directions, we did not get any drift at all. To prevent drifting between colonies, the colonies should have entrances pointing in different directions and have a greater distance between them. This can help prevent the transfer of diseases between colonies. Connor, L. 2012. Beekeeping Instructors’ Guide. Drone Bees. Fourth in a Series. Bee Culture. April 2012, pp. 44-46. Currie, R. W. and Jay, S. C. 1991. 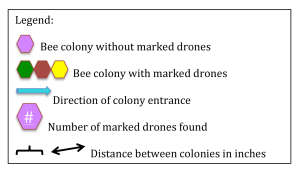 Drifting behavior of drone honey bees (Apis mellifera L.) in commercial apiaries. Journal of Apicultural Research. Vol 30(2) pp. 61-88. Next Next post: Science Fair: Pollen Power!